Q1: Question 1: Study sources 1, 5 and 11. These pictures show a harrow being used. (i) Describe a harrow. (ii) Explain what a harrow was used for. (iii) Identify two methods that medieval farmers used to stop the birds eating the seeds they planted. A1: (i) A harrow is a wooden frame with iron spikes at the bottom. (ii) The harrow was used for breaking up the soil and covering over recently planted seeds. (iii) The pictures show two different methods used by medieval farmers to stop birds eating their seeds. Source 1 shows a scarecrow dressed like an archer. Source F illustrates a man throwing stones at the birds. Q2: Study sources 3, 4, 7, 9, 11 and 12. What evidence is there that some farming equipment in the Middle Ages changed while others stayed the same? A2: Although there is a gap of nearly 400 years, the ploughs used in sources 5 and 12 are very similar. However sources 7 and 9 show a development in the tools used for reaping. In source 9 the men are using sickles (14th century) whereas in source 7 they are using scythes that were first used in the 16th century. The main advantage of the scythe over the sickle was that it was faster as the peasants could use it standing up. Q3: How did medieval farmers attempt to maximise the food that their land produced? 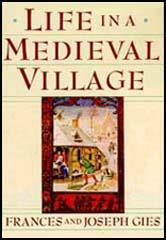 A3: Medieval farmers used several different strategies to increase the fertility of their land. Before planting their seeds they ploughed their land to remove thistles and weeds. They also used the three-field system of crop rotation. This allowed one field to be left fallow and ensured that the same crop was not grown in the same field two years running. To increase the fertility of the land, marl, seaweed or animal dung were used as fertilisers. Medieval farmers also had to make sure they harvested at the right time. If the wheat was too dry the grain would fall off and if was too wet the grain would rot. Q4: Give as many reasons as you can why people in the Middle Ages sometimes died of starvation. Select passages from the sources to help you answer this question. A4: One of the main reasons for starvation was that some families did not have enough land. Manor records show that about twenty per cent of peasant families did not have enough land to provide themselves with an adequate diet. The problem was made worse by taxes. The author of source 2 points out that he had to sell his seed in order to pay his taxes to the king. There was also Church tithes to pay. Extreme weather conditions was probably the main reason why people died of starvation in the Middle Ages. As source 6 points out, the floods in 1257 resulted in large-scale famine. Q5: Study sources 3, 5 and 9. Describe the different tasks these people are performing. What order would these tasks have been performed during the farming year? A5: The tasks that the people are performing in these sources include harrowing and sowing (3); ploughing (5) and reaping (9). The order that these tasks would have been performed in the farming year was ploughing, sowing, harrowing and reaping.